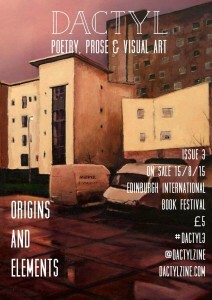 Dactyl is a new, Scottish-based publication for poetry, prose, illustration and photography. In April 2013 we issued a call for entries seeking original, contemporary work responding to the theme ‘Lost & Found’. Our very first issue (our baby!) was launched in Edinburgh in November 2013, and includes never-before-seen work from 21 contributors. Dactyl 1 is available to buy now. Dactyl’s second issue, Time & Space, was launched on 15 August 2014, and is currently sold out, awaiting stock. 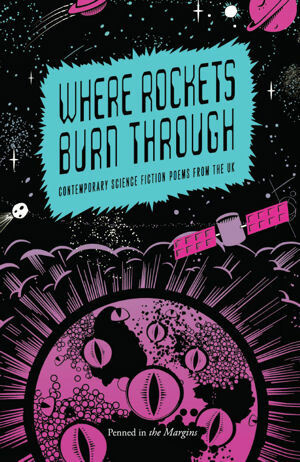 The launch event in Edinburgh will be in September, but you can pick up a printed copy from 15th August at the Edinburgh International Book Festival bookshop. EIBF #shelfies to come! My ‘Moon Man’ poem is about an astronaut who has returned to earth after his space mission. I was inspired by an interview I’d read with an ISS astronaut. His line about seeing 16 sunsets/sunrises a day, from the ISS rotating around the earth, got my gears turning! I built the poem around this line, but over the course of it, (and including the title), it turned into a poem about an astronaut returning from the moon. BUT, on the moon, the sun rises and sets over the course of 2 earth-weeks. (So the earth would experience ~14 sunrises/sets in the time the moon would experience 1 rise/set.) Thus, the 16 sunsets for one of yours line isn’t factually accurate… but I kept it. I felt like, ‘One sunset/sunrise for 14 of yours’, didn’t resonate as strongly… Difficult! I mean, (taking from another line in the poem) the moon is also not a million miles from earth (its ~200k miles). But perhaps ‘a million miles’ is hyperbole for ‘really far’ and therefore acceptable? Maybe I should have changed the line, called the poem ‘Space Man’, made it perfectly accurate. What do you reckon? Poetic licence? Any budding astrophysicists notice anything else I missed? Hope you’ll go and check out a copy and let me know what you think!